Lori Portillo, Thunderbird Lodge Retreat's owner, was born and raised in Paramount, in the heart of Los Angeles. In 1982, she moved with her husband, Abel, to Joshua Tree. Lori was immediately drawn to the stunning area around La Contenta Road, near the Covington Flats entrance to the Joshua Tree National Park. Her attraction was due to the exquisite beauty of the landscape, wildlife, and tranquility. Prior to moving to the community, she visited since the early 1960s to spend time with family who lived here. In the 1930s, her grandfather, a former LA police officer and Texas cowboy, relocated to the area. When he first arrived, there was only a dirt road from Banning on – for about 30 miles. He was a well-known local character. During prohibition, he made his own beer and also ran the cabins now known as Willie Boy's Restaurant in Morongo Valley. Lori and her family visited often on the weekends and during summers. Five years ago, she started converting homesteader cabins that had previously been longterm rentals. After the financial collapse of 2008, as well as surviving both her husband and mother dying (in 2011 and 2010 respectively), Lori was at a crossroads in her life. She was also in a bit of financial panic. And had to figure something out. 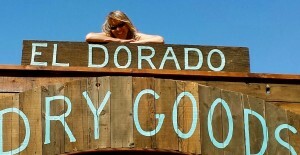 Lori decided to just go for it.... starting the Thunderbird Lodge Retreat. Her vision is to create an oasis in the desert with comfortable, charming spaces for adventurous, artistic travelers. Consequently, the project turned out to be a perfect outlet for Lori's creative sensibilities. She is a lifelong artist who always had an interest in tools. Lori infuses each Thunderbird Lodge Retreat cabin with unique touches. These include custom tile work, eclectic vintage furnishings, shadow boxes, and, in the case of the new Ranch House & Saloon, a Western "town." The town, El Dorado, is in the Ranch House backyard and features a functional saloon with gaming tables. Lori is particularly committed to incorporating recycled materials into each of her cabins. This allows her to not only to divert the waste stream but also take advantage of the aesthetic beauty in the scavenged objects. The history imbued in the objects also adds to the character of each Thunderbird Lodge Retreat cabin. While much of the carpentry and creative work in the houses is completed by Lori, she is also grateful for the building skills that she has learned from others. Lori has received tremendous support from a number of friends and relatives, including her cousins and brothers, among many others. In 2011, she converted her first homesteader cabin, the Shell House. Today, she has seven operating vacation rental spaces.